New regulations require pipeline owners to non-destructively measure the tensile properties of buired line pipe in cases where these data are not known. The MPM Instrumented Indentation System (I2S) system is used in field inspection applications for this purpose. The system is powered by a rechargeable battery for up to 12 hours of field measurments without recharging. It can be charged and/or run from an automobile cigarette lighter socket or standard 120/220 VAC outlet. The system is provided with the battery and control consolette on a hand truck for easy movement to the NDE site. Extra-long cables are provided with quick-disconnects for easy setup at the inspection site. A magnetic base is used for attachment to magnetic materials, and a mechanical attachment is also provided for non-magnetic material inspections. 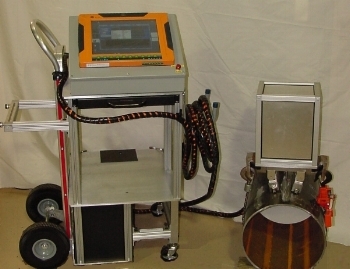 The I2S-FA has been designed to operate from a pickup truck, or it can be transported to a pipe inspection location where it is not possible to drive to for the inspection. If truck access is possible, the power supply can be left on the truck in a secured position. If not, the I2S, power supply cart, and control computer can be maneuvered to the inspection location. The MPM I2S fully satisfies ASTM Standard E2546, “Instrumented Indentation Testing,” and the applicable portions of ASTM Standard E10, “Brinell Hardness of Metallic Materials.” The Brinell measurements made with the I2S are within the precision data reported in ASTM E10. Further, it has been demonstrated that the I2S equipment yields data that are consistent with the scatter in uniaxial tensile measurements (ASTM E8). For example, data for an A36 structural steel alloy resulted in an uncertainty of about 5 ksi at the 99 % confidence interval, whether it is measured by uniaxial E8 testing or by the I2S indentation test.